The haka is a traditional genre of Māori dance. This picture dates from c. 1845. The haka (plural haka, in both Māori and English) is a traditional war cry, war dance, or challenge in Māori culture. It is a posture dance performed by a group, with vigorous movements and stamping of the feet with rhythmically shouted accompaniment. War haka were originally performed by warriors before a battle, proclaiming their strength and prowess in order to intimidate the opposition, but haka are also performed to welcome distinguished guests, or to acknowledge great achievements, occasions or funerals, and kapa haka (performing arts) groups are very common in schools. Although the use of haka by the All Blacks rugby union team and the New Zealand rugby league team has made one type of haka familiar, it has led to misconceptions. Most haka are performed by men. There are however some haka which are performed predominantly by women – one of the most well-known being the Ngāti Porou haka "Ka Panapana". In modern times, various haka have been composed to be performed by women and even children. Haka are performed for various reasons: for welcoming distinguished guests, or to acknowledge great achievements, occasions or funerals. War haka (peruperu) were originally performed by warriors before a battle, proclaiming their strength and prowess in order to intimidate the opposition. Today, haka constitute an integral part of formal or official welcome ceremonies for distinguished visitors or foreign dignitaries, serving to impart a sense of the importance of the occasion. Various actions are employed in the course of a performance, including facial contortions such as showing the whites of the eyes and poking out the tongue, and a wide variety of vigorous body actions such as slapping the hands against the body and stomping of the feet. As well as chanted words, a variety of cries and grunts are used. Haka may be understood as a kind of symphony in which the different parts of the body represent many instruments. The hands, arms, legs, feet, voice, eyes, tongue and the body as a whole combine to express courage, annoyance, joy or other feelings relevant to the purpose of the occasion. The various types of haka include whakatu waewae, tutu ngarahu and peruperu. The peruperu is characterised by leaps during which the legs are pressed under the lower body. In former times, the peruperu was performed before a battle in order to invoke the god of war and to discourage and frighten the enemy. It involved fierce facial expressions and grimaces, poking out of the tongue, eye bulging, grunts and cries, and the waving of weapons. If the haka was not performed in total unison, this was regarded as a bad omen for the battle. Often, warriors went naked into battle, apart from a plaited flax belt around the waist. The tutu ngarahu also involves jumping, but from side to side, while in the whakatu waewae no jumping occurs. 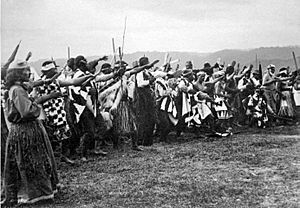 Another kind of haka performed without weapons is the ngeri, the purpose of which was to motivate the warriors psychologically. The movements are very free, and each performer is expected to be expressive of their feelings. Manawa wera haka were generally associated with funerals or other occasions involving death. Like the ngeri they were performed without weapons, and there was little or no choreographed movement. The most well-known haka is "Ka Mate", attributed to Te Rauparaha, war leader of the Ngāti Toa tribe. The "Ka Mate" haka is classified as a haka taparahi – a ceremonial haka. "Ka Mate" is about the cunning ruse Te Rauparaha used to outwit his enemies, and may be interpreted as "a celebration of the triumph of life over death". According to Māori mythology, the sun god, Tama-nui-te-rā, had two wives, the Summer Maid, Hine-raumati, and the Winter Maid, Hine-takurua. 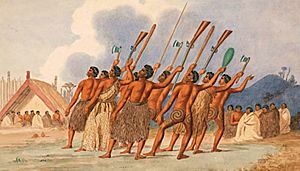 Haka originated in the coming of Hine-raumati, whose presence on still, hot days was revealed in a quivering appearance in the air. This was the haka of Tāne-rore, the son of Hine-raumati and Tama-nui-te-rā. Haka Facts for Kids. Kiddle Encyclopedia.